This past summer we got in touch with Danfredo Photography to collaborate on this fun styled shoot. We'd never worked with them before, and we were totally crushing on their bright, fun, goofy vibe. Danielle from Danfredo had just learned about this new space in South Philly — The Bok Building — and was super eager to shoot there. It's a former vo-tech high school that closed a few years ago, then was recently purchased by a super talented team of urban planners with grand ideas. Um — an opportunity to do a styled shoot at a killer old high school building with a rooftop view of Center City Philly? Obviously we were on board. And obviously our concept would be "back-to-school." We'd paint the story of a couple of high school sweethearts. Cue flashbacks of eraser tops on pencils, folded love notes, and writing naughty words on the chalkboard. Let's back up a moment to give you a glimpse of our process. When we collaborate on a styled shoot, we establish a concept (a realistic story), a color palette, and a couple of stylistic ideas for all vendors to use as a starting point. Then, we encourage each vendor to interpret that concept and color palette in their own way. When everyone has that central starting point paired with the freedom to riff of it, magic happens! Durga-Kali provided the bridesmaid dresses for this shoot, and since this is one of the first decisions made, we let the dresses inspire our bright color palette. The colors totally have a back-to-school vibe, right?! Sulimay Urban Salon then created a look for each of the models that complemented each of the lady’s bold looks. Today’s wedding trends shy away from the bold, but we think couples should do whatever they want. If you love emerald and sapphire, go for it! Use both! And throw in hot pink while you're at it. Sebesta Design was totally game for the bold color palette, which was a huge departure from what couples had been asking her for in 2015. She brought her A-game with the varied florals in chemistry beakers and vials, then she took it to the next level with all of that texture — embracing that fun and weird vibe we were going for. We all geeked out over the fun props we got to incorporate with this shoot. Nutmeg Cake Design did an A+ job with the super cool chalkboard cake she created. You can’t have a back-to-school shoot without chalkboard. Take note — those flowers on the cake are sugar flowers made by Nutmeg. Guess she was gunning for some extra credit. Hello, Bird created the fun school-themed stationery. She jumped at the excuse to pull from composition books and scantrons as part of her design story. We all shared an "awwww" moment when she pulled out the paper-folded fortune tellers and expertly folded secret love notes. She owned that nostalgia factor. Every time we look back at this shoot we get all warm and fuzzy. It was so much fun! That’s what your wedding should be: FUN! And perhaps the best part of this shoot is that because it’s all totally attainable. 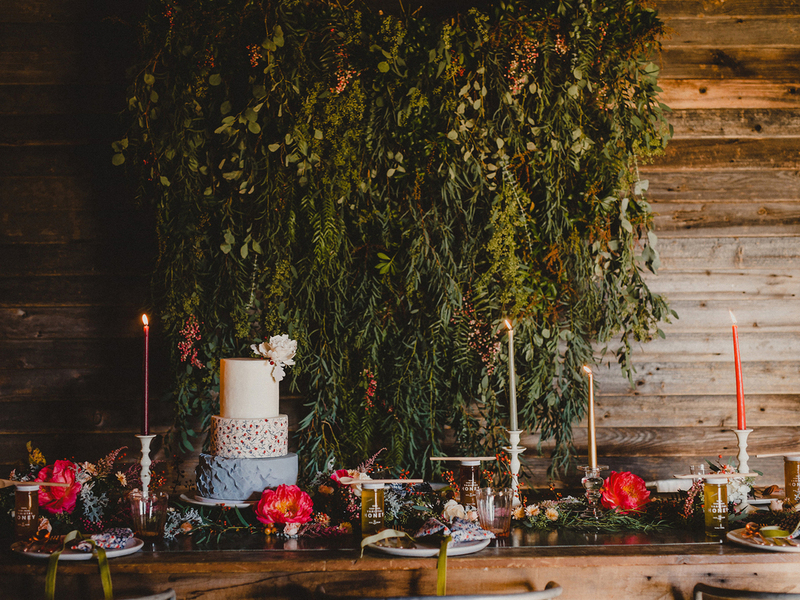 You could actually style a head table this way. You could really get married at The Bok Building. Well, soon, anyway. More on that later. Wink wink. Originally featured on Ruffled Blog. By the numbers, our first year consisted of designing SEVEN brand identities, planning and designing EIGHT weddings, launching ONE amazing new wedding venue, planning a killer dance party on a bridge for over a THOUSAND people, TRIPLING business for our very first retainer client, planning and designing TWO styled shoots, and launching Lady Boss — which now has over a HUNDRED members (and we've expanded into Baltimore)! But enough with the numbers for now — we know you're here to see pictures! We kicked off with our own brand identity. We hand painted everything, and then digitized. The ampersand in our logo contains a hidden heart (a subtle nod to SZ's former business, "Jackalope Heart"). And the pattern is made up of Juniper branches (a secret reference to SK's former business, "Juniper & Dash"). We added these secret touches to honor where we started and celebrate the two of us merging together to form something new, but rich in history. Stefanie and Eric called on Heart & Dash to plan and style their beautifully elegant wedding at Terrain. We also designed their wedding stationery, including save the dates, invitations, programs, reception signage, and hotel welcome bags — which pulled every last detail together just the way they'd envisioned. Photo by Svetlana Photography. Angela dreamed about launching a boutique event rental company for years, but needed input on getting started — like what to charge and how to structure the rental process. We got together for multiple sessions to iron out the details with her. Simultaneously, we designed her brand identity so she could finally launch her dream business! We thoroughly enjoy helping companies build their brand — from processes to visuals — for a totally cohesive experience. Kristen and Jay decided they wanted Heart & Dash to take care of the logistics for their weekend-long camp retreat wedding — and we could not have been more excited about our role as Camp Counselors for the weekend. We are eager to do more weekend-long retreat weddings — summer camps, lodges, mountains in the woods, family ranch — you name it. Photo by Jessica Osber Photography. Non-profit Delaware Greenways manages Historic Penn Farm in New Castle, Delaware, and they had a vision to turn its 50 year-old unused barn into a wedding venue. Everyone on the board was new to the wedding industry, so they enlisted Heart & Dash's expertise in what's needed to launch a successful venue. We worked with them on a long-term basis to develop a brand identity, construction plans, policies, rental agreements, pricing, open houses, tours, and more. They hosted their very first wedding in the Fall of 2015. Now we're ready to help launch more venues in the Mid-Atlantic! Heart & Dash planned the second year of Harvest Dinners at Faunbrook Bed & Breakfast (we actually started the series two years ago — it was our first collaboration, and it inspired us to start Heart & Dash). We kicked off the second year with a cucumber-centric menu — which we're proud to say was a sell-out event. Photo by Redfield Photography. Lori and Paul had Heart & Dash plan and design their elegant-yet-rustic barn wedding. It makes us so dang happy when we see that couples are truly relaxed, laughing, and enjoying their day with their friends and family. These two laughed all day long! Photo by Lauren Fletcher Photography. Annie had done everything she could on her own to build her papercut business, and decided it was time to invest in professional branding. The tricky part (or so she thought) was to make sure that her new look would reflect her artistic style — since, after all, she is an artist. We learned as much as we could about what makes her style unique, which resulted in her fully trusting us to incorporate her style into the identity. We were beyond excited to hear she made a return on her investment right away! We're looking forward to helping more artists showcase the value of their work. Anne — who already has a super successful wedding blog — had this fun idea to start an alternative clothing line for wedding parties. She asked for help with four big things: 1) A business name; 2) A brand identity; 3) Packaging; and 4) A product photo shoot. Because She Riot is an online business, she and her business partner (who also happens to be her husband) knew it was especially important that the unboxing experience was special — so they enlisted our help in designing the box and contents. For the photo shoot, we saved Anne from overwhelm by helping her create a vision board, sourcing the models, developing a shot list, organizing products and props, styling the models, and collaborating on the vision with the photographer throughout the day of the shoot. Photo shoots are some of our favorite days and they can really help build a brand. The second Harvest Dinner at Faunbrook of the year was inspired by blackberries — another sold-out event! Photo by M2 Photography. Heart & Dash teamed up with a dream team of vendors for an inspirational styled shoot at the Bok Building in Philadelphia. The shoot was featured on Ruffled! We have some exciting news to share about Bok to kick off our second year — stay tuned! Photo by Danfredo Photos + Films. As part of our ongoing retainer marketing for Faunbrook Bed & Breakfast, we redesigned their brand identity to reflect the historic elegance of the property and appeal to the types of clients who book events and stay there. We used the brand identity along with the photos from the Harvest Dinner series to design and launch their new website. Since the brand identity and website launch, Faunbrook's business has tripled. We hope work with more B&Bs and Inns (perhaps in Delaware and Maryland) in the future. We could not contain ourselves when The Knot approached us as their first choice to plan and design their annual market event, which is an appreciation networking event for Philadelphia area wedding vendors. Like seriously, we were jumping up and down when the initial email about this event popped up in SK's inbox. We had a great time bringing this one to life — and making sure it had a relaxed and fun vibe. Photo by Emily Wren Photography. A year of meeting and planning paid off on the night of the 5th annual Dance on the Falls Bridge in Philly. The non-profit East Falls Development corporation had been doing this fundraiser event on its own for the first four years and decided it was ready for an upgrade, so they hired Heart & Dash to help with the 10 months of planning. The result? We maxed out bridge capacity with a sold-out event and brought in 40x more profit than any previous year of the event. They hired us again for their sixth year! Save the date: September 17, 2016. Photo by BG Productions. Planning a tented backyard wedding seemed like a simple DIY option to Sarah and Troy, but once all of the vendors started coming together they were overwhelmed. So they reached out to Heart & Dash! The grand finale for their wedding was a huge bonfire built by the bride's father. So much fun! Photo by Nate Heckenberger. We teamed up with photographer Pat Robinson for this killer inspirational styled shoot at Terrain with the goal of getting published on Green Wedding Shoes for the first time. Success! It was published the first week of January! Photo by Pat Robinson Photography. Heart & Dash was hired for a private event at a beautiful horse farm in Maryland this past October. Oh, how we wish we were allowed to take more pictures at this one — but some things have to live inside our heads! Now that we've had a taste of it, we'd love to do more. We're envisioning backyard weddings, sailcloth tents, and collaborative vendor dream teams in the Mid-Atlantic! The third and final 2015 Harvest Dinner at Faunbrook was inspired by apples. Another sold-out event! Photo by Amy Tucker Photography. Thomas and David wanted to work with Heart & Dash because they loved SK's event design skills! Collaborating with these two on their vision was absolutely dreamy because these gents have some serious style. We also enjoyed the opportunity to work at a venue that was completely new to us. Cheers, Thomas and David — can't wait to share more photos from your wedding soon! Photo by M2 Photography. Aly from Wild Cotton Photography has a modern southern style, and though she had designed a pretty good logo for herself — she decided it was time for a cohesive upgrade. She wanted the quality of her brand identity to be as strong as her photography portfolio. She wanted all visual aspects of her brand to communicate the level of talent and service she provides her clients. So we worked with her (via phone, FaceTime, and email since she's down in Nashville) to create this elegant look. We hope to work with clients from all over the country in the future! Thanks again for your support (and for reading this doozy of a blog post). And with that, we better get back to work on some exciting new projects for year two! Dance on a bridge...yes please! We are thrilled to be working on this unique event, producing a dance that takes place ON the Falls Bridge! East Falls Development Corporation — a non-profit focused on building community — is hosting this event on September 19, 2015, and they hired Heart & Dash to help make it bigger than ever before! Their goal is to make it feel extra special for its fifth year. We accepted the challenge. Check out the Dance on the Falls Bridge Facebook page to stay updated on all event information and make sure to snag your tickets before this awesome event sells out. You can use the code 'EARLYBIRD' to take advantage of the discounted rate of $59 for an individual ticket. Or take advantage of purchasing a VIP group ticket which includes 10 tickets and a reserved table for your group!